Find all our conferences organised in collaboration with our partners! On June 28, 2017 took place the third edition of the conference« WeLoveSEO », the search marketing event for SEO professionnals. On September 7, 2016 took place the second edition of the conference « WeLoveSEO », the search marketing event for SEO professionnals. 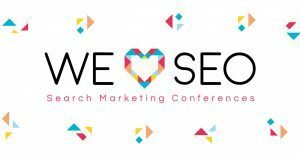 In November 2014, the first edition of the “WeLoveSEO“ conference was held, an afternoon devoted to international SEO issues. This event was organised in collaboration with our partner TextMaster and RocketLinks.